All Hands Raised will receive a $200,000 grant to focus on more young people having access to well-paying and fulfilling careers in growing industries. 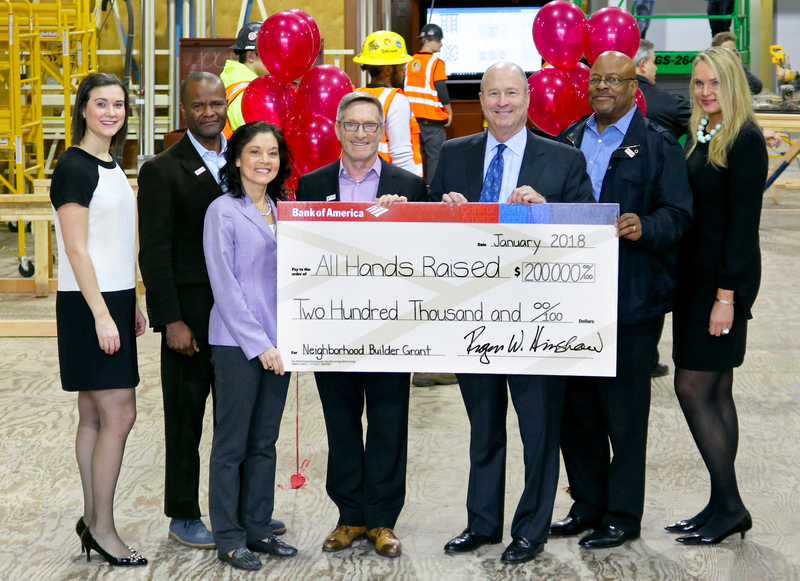 PORTLAND, ORE. – Bank of America has just announced All Hands Raised as its 2018 Neighborhood Builder winner. The nonprofit is being recognized for its commitment to education, equity and excellence from birth to career, and for their innovative work in mobilizing support to ensure young people in Multnomah County achieve their full potential. Through the Neighborhood Builders program, each year the bank provides one Portland-area nonprofit with a unique combination of leadership training, $200,000 in flexible funding, volunteer support, and a network of peer organizations across the country. Last year’s winner was New Avenues for Youth. With this grant, All Hands Raised will fully launch a “Pathways to Construction & Manufacturing Careers” program in partnership with six area high schools, which collectively serve 12,000 students. The seeds for this work were planted through an initial partnership with two schools: Reynolds and Centennial high schools. After two years of focused effort at those schools, this work resulted in measurable success and enthusiastic support from students, educators and local employers. Ryan cited the more than 30,000 construction and manufacturing jobs that will be added in the Portland region over the next 10 years, combined with unprecedented levels of retirements. Yet the pathways to those careers are largely broken, incomplete or absent — and local career-technical education programs have not recovered from past cuts, nor fully aligned with the current needs of local industries. “Building effective teams on-site in local high school communities that bring together students, parents, teachers, local employers and career training programs all around common goals, measures and improvement strategies is powerful,” says Ryan. “In sum, this well-timed investment by Bank of America will allow our local partnership to develop a stronger awareness among educators of the living-wage job opportunities in our community, and will truly be a game-changer for our local high school students and their families,” Ryan noted. Since its inception in 2004, Bank of America’s Neighborhood Builders program has helped nonprofits create greater impact in their communities and better prepare for the future by providing the tools and resources they need to develop stronger strategic plans, chart a succession strategy, navigate through tough economic times, and enhance their funding opportunities. Since the program’s beginning 14 years ago, Bank of America has invested more than $220 million in nearly 1,000 nonprofits and 2,000 leaders across 45 U.S. communities, including Portland — and the program has been recognized as the nation’s largest philanthropic investment in nonprofit leadership development. Neighborhood Builders is a demonstration of the bank’s work to address issues fundamental to economic mobility in order to build thriving communities and illustrates how strong cross-sector partnerships and local community leaders can play a meaningful role in positioning communities for success. Learn more at www.bankofamerica.com/about and connect with us on Twitter at @BofA_News. All Hands Raised (AHR) is an independent community-impact organization that mobilizes support to ensure every child in Multnomah County achieves their full potential. As the backbone organization for the All Hands Raised Partnership, AHR delivers direct support that empowers educational outcomes for the more than 220,000 children, youth and young adults living in Multnomah County, from birth to career. With an acute focus on racial educational equity, we bring together partners throughout the community to improve the following focus areas: Racial Educational Equity, Kindergarten Transition, K-12 Attendance, Ninth Grade Transition, Post-Secondary Access & Completion and Pathways to Construction & Manufacturing Careers. This work is focused on getting youth to and through graduation with the ultimate goal of being connected to a career and on the path to a successful life. Learn more at www.allhandsraised.org and connect with us on Twitter @AllHandsRaised.